Looking for the Best Moving Company in Arlington, VA and the Best Moving Company in Fairfax? Then you’ve come to the right place! This is the fourth consecutive year that My Guys Moving & Storage has won the prestigious award for top-rated movers moving Sun Gazette readers as well as residents of the Washington DC Metro Area. With over 500 nominees, we were in good company with Georgetown Cupcakes, Whole Foods, Trader Joe’s, movie theaters, fitness studios, and senior living facilities. This year’s ballot ran from February 1-28, which combined thousands of votes cast for favorite Fairfax and Arlington businesses. We realize that homeowners and apartment renters have plenty of choices when it comes to finding the best movers in the region, so we appreciate the selection as the best moving companies for the past four years. My Guys continues to serve Maryland, DC and Virginia by providing professional full-service moving & storage for home and office. 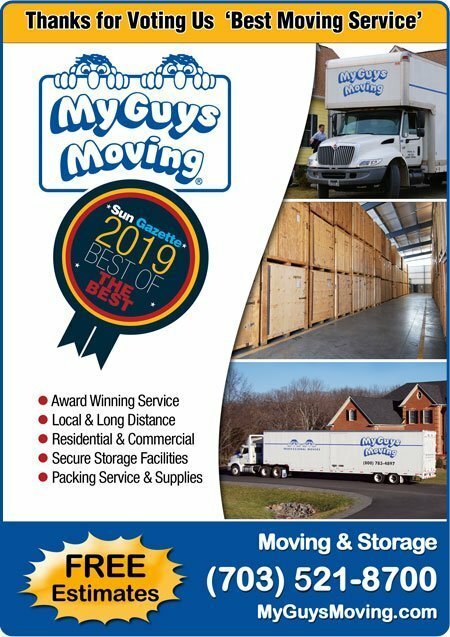 If you voted for My Guys Moving & Storage, thanks for selecting us as the Best Moving Service in Arlington 2019 and Best Moving Service in Fairfax 2019. We couldn’t do it without you! Check us out on Instagram to see how we make moving fun, and Facebook for more great posts and updates. And remember… Have Your Guys, Call My Guys!